For a sample use case check out an excellent blog post on Painting a Goat Barn with Milk Paint by our friends over at Domestic Geek Girl. Homestead House and Miss Mustard Seed milk paints are organic, biodegradable and Zero VOC! The formulation of the raw ingredients are the same for both lines, however the Miss Mustard Seed Line are custom designer colours. Homestead House colours depict more of the pioneer and colonial era of colours popular in those time periods.For more beautiful colours in the Milk Paints please visit our colours section. 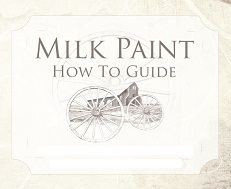 As Canada's only milk paint manufacturer, we continue the tradition of our past by producing authentic milk paints using similar basic ingredients.. Our recipe stays true to that of an authentic milk paint containing natural ingredients such as chalk, clay, limestone, casein (a milk protein) and pigments. Unlike some Milk Paint found in a can there are NO VINYL resins. Milk Paint is the oldest natural paint known to man and can still be found in some cave paintings. This paint contains milk protein (casein), limestone, clay, chalk and natural non-toxic pigments made from iron oxides and those synthesized from natural resources. The result is a very durable paint popularly used by modern designers, green consumers and home owners seeking to capture a variety of modern, trendy, antique and textured looks ( in fact when using less water than called for the texture can even be used for embossing !! ).Our authentic milk paint provides a long lasting, very durable and hard as stone finish for interior or exterior uses! No other modern paint can create the unique look that can be easily achieved by using Milk Paint. It can absorbed into a porous surface tol never chip or peel. Milk Paint is suitable for both interior and exterior applications and is naturally mould resistant. Milk paint provides a completely breathable coating and is ideal for painting plaster, drywall,primed drywall, straw bale houses and a variety of other surfaces. With our Bonding Agent you can now use Milk Paint on even more surfaces such as previously painted walls with a gloss sheen, varnished or lacquered surfaces, previous coats of paint, ceramic tiles, meta or, glass. • Using a blender to mix creates a nicer consistency to work with. • Milk Paint can be layered to create custom effects. • Milk Paint dries in 30 minutes! • Always test your colours first. • Avoid using a primer as a porous surface is required to absorb Milk Paint. • Milk paint should be sealed with a top coat. • Use Milk Paint Bond to allow adhesion to previously painted or varnished surfaces. • Slight shade and colour variations may occur between batches. Purchase enough paint to test and finish your entire project. Be sure to save some for future touch ups. “I needed paint and finishes to restore my kitchen table and chairs but I wanted the safest and most eco-friendly products. I was really happy to find homestead house paint's milk paint and no-VOC finishes. The milk paint is easy enough to use, really safe and gives excellent results. The same thing goes for the Hemp Oil finish and Beeswax. I simply love everything. “I am trying to create primitive american furniture. The paint quality is excellent, and the look is perfect. I cannot imagine why people would choose retail latex or oil paints over milk paint. The product is vastly superior." Homestead House Milk Paint . When added to Milk Paint, the bonding agent allows milk paint to be used on non-porous surfaces. Milk paint can now be used for many different surfaces such as painted walls, latex paint, oil paint, varnish, glass, metal etc. Contains no VOCs. Shake well before using. For optimum adhesion, clean the surface to be painted with T.S.P. and sand lightly to roughen the surface. Always test adhesion before applying to a large area. To use with Milk Paint: Mix one part of bonding agent to two parts of milk paint already mixed. For an even stronger grip, mix in equal parts. Mix the bonding agent with all coats of paint for optimum adhesion. Wait 2 hours between subsequent coats. How much Bond do you need? 250ml will be sufficient to add to 1 Quart of mixed milk paint. 500ml will be sufficient to add to 2 Quarts of mixed milk paint. 1 Litre will be sufficient to add to 1 Gallon of mixed milk paint. 1 Gallon will be sufficient to add to 4 Gallons of mixed milk paint. Our Furniture Wax is a fine museum quality wax based on an old family recipe. It is easy to apply, provides a durable finish with a beautiful luster and has almost no odor. The Antiquing wax is the same formulation as the Furniture Wax, however lightly tinted to a rich brown, perfect for creating an authentically aged finish on a piece of painted furniture. Use a clean cotton cloth or brush to apply wax in a thin layer, working into recesses of carved details or surface imperfections. Wipe away excess. Allow it to dry for 3-5 minutes. Buff to a shine with a clean lint-free cotton cloth. This product may be applied directly over dry milk paint or other painted surfaces such as Chalk Paints, Latex Paints for an increased lustre and protection.. Clean brush with soap and warm water. White Wax is a fine museum quality wax is based on an old family recipe. It is made from beeswax with a little carnauba wax and is then tinted with a creamy white, perfect for creating a faded, washed or limed look on a piece of painted furniture. It is easy to apply, provides a durable finish with a beautiful luster and has almost no odor. Not recommended for exterior use. Please see our Tung Oil for exterior applications. This oil does not contain UV protectors, therefore the wood will age, darken and grey. Our value packs allow you to save by bundling all the essentials to get started together in a single package. They include a selection of our most popular colours and are available in 3 full Quart sizes. For exact placement of distressed lines and edges use the wax . Press the wax along the edges where you would like to see the distressed antiquing effect between layers of paint, or over your first coat of stain, and in between each layer of paint. Anything that is applied on top of the waxed areas will resist the paint. You will notice this resist once you are giving your piece a light sanding at the end of your application of all layers of paint. So many times when distressing it is easy to sand right through all the layers- this prevents this from happening! The stain or paint underneath the wax will remain in place, and any paint applied on top of the wax will come off effortlessly, allowing for the perfect distressed look. Our excellent quality brushes are made of smooth hardwood and dense white china bristles firmly epoxied into a nickel-plated ferrule! These strong, yet flexible bristles hold and slightly absorb the paint or wax which allows for more control while applying. These easy to hold brushes have contoured beaver tail handles for a controlled grip. We love these brushes because they’re a fantastic all-in-one applicator as they can be used to paint, and then be used to wax! All three brushes have a bristle length of 2 inches and a total length of 8 inches. Width 1.5" 1 3/4" 2 1/4"